Lots of people have done a year in review but this year has been kinda dull and really slow, it has been eventful so I’m not so much going to do a year in review as I am going to point a few highlights out from 2017. Late last year my shoulder surgery was delayed for one reason or another so to fill the gap I booked a dozen or so driving lessons over the 4 weeks gap between cancelled surgery, after passing my driving theory test first time a few months before. In the theory test I scored pretty close to a perfect score. Only 1 question wrong in multiple choice which still haunts me as I know exactly which question it was. I was also a little slow on one or two hazard perceptions videos but still nearly perfect is good enough. 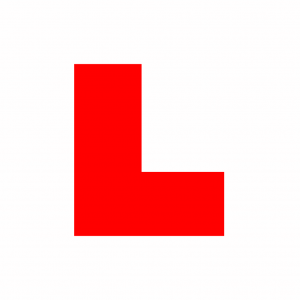 I started my driving lessons towards the end of January. This meant I had driving lessons in the frost, in the fog, in the snow, in the rain and ice and all that’s in between giving me really good all around experience. The worst was stuck in rush hour traffic on a 1/4 mile hill, which moved a few cars at a time, and meant non-stop constant hill starts, which was about my 4th driving lesson so yeah that wasn’t fun. When I passed my test about 4-5 weeks later I had 3 minor faults so my Driving Instructor John Swan did a pretty good job, in a very short space of time and literally just a few days before my surgery. My shoulder surgery turned out considerably more complex than planned, originally it was a Rotator Cuff Repair, and AC Joint Repair, it changed something much more once my shoulder was opened. My shoulder healed record fast, I was discharged from physio in just over 2 months, out of a planned 5-6 months. The surgeon wanted to discharge my left shoulder at 4 months, as fully healed and fine, out of an expected 9-12 months. All in all the healing process, very quick for the amount of work I had no one expected it to be so quick. My return to the gym hasn’t been so quick, the many areas bone was cut away, or ground down was raw and exposed and then left soft and gooey, waiting for the scar tissue and hardening has been a long slow process. It was expected to be 18-24 months before fully healed. I could put some moderate weights on it at 6-7 months, by some I mean about 40% my maximum, where as a month before surgery I could manage about 20% of my maximum. For example bench-press, my max as been around 115-120kg (including the bar), a month before my surgery I could barely move 30kg with bad form, now I can move 50kg for 8, so definite improvement but still long way to go. I have done my first actual shoulder work out, including farmers walks, waiter walks, shoulder press, shrugs and upright rows, my grip is screwed, not sure I’ll get that back due to a torn tendon in my forearm and damage to my hand, so maybe stuck using straps and hooks. It has however 100% improved from pre-surgery, however under load when the bones appear to be touching, OUCH! I don’t think I’ll ever be able to squat again, the work on my glenohumeral has almost certainly left me with impingements meaning I can’t get my arms into position. Maybe some yoga or pilates will help, but I don’t know. For all the controversy, hassle, and fanfare over the Rich Piana crazy train, the man was a decent guy and a powerful inspiration to many. I don’t agree with his Synthol or PMMA or whatever the hell he was injecting to get his crazy size but he loved his fans and had a lot of respect for them. Way way more respect then almost anyone I have ever seen I’ll never forget him apologising to fans waiting while he did press photo ops, or for the long wait to see him, or even when he took his lunch/drinks breaks. Not ONCE, did I notice him rush a fan, cut one short, he spoke to them for as long as they wanted, and had a laugh, happy posing with fans, by all accounts he was a rock solid guy. The only other person who was equally popular who was a chatterbox was Kai Greene, he was being told off all the time his people for taking too long with fans. Most of my year has been waiting, recovering and planning. Now I’m I’d say 85-88% recovered and able to put some power down on the left shoulder, and I’m not sure I want the right shoulder done. I started training again between Christmas and New Year’s Eve, so that gives me 9 months out. I’ve lost about 1okg of muscle mass (rough estimate based on my monthly bio-impedance), and gained about 6-7kg total weight, which is pretty diabolic. About 2 months of that was pretty no gym and comfort eating a lot. I’m getting back on the ball slowly now. Diet is horrific to reign back in to boring stuff again, I may need to just go for a crash and go meat, veg, sweet potato, and try reset it. 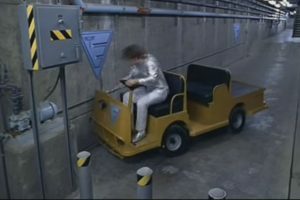 Austin Powers 3 Point Turn copyright of Warner Brothers. January is turning in to somewhat of a monstrous month on the whole, and February is shaping up to be chock full of pain and misery. The first 3 weeks of 2017 have been monstrous, and the next month is shaping up to be equally horrific. Welcome to 2017, its not exactly year I had in mind… in any way, shape or form. My Pre-Op and Surgery have clashed not once but twice with my driving, and now the surgery classes badly with some work related issues; same day to be exact. The surgery clashed with my Driving Test, and the hospitals waiting list manager were shall we say unsympathetic and unwilling to change the date. This may end up being a moot point as I’m getting ill, I have a sore throat, and shivers. I seem to be coming down with a cold or flu and less than 2 weeks til the surgery. Again the waiting list people don’t seem concerned even though all the NHS Documentation paints a very grim picture. Aside form that, there does seem to be a little discrepancy, the lady who also weren’t very sympathetic told me I were having slightly different surgery to what the surgeon / consultant told me. They did confirm the two biggies which are Subacromial Decompression and AC Joint Excision. I assume once they open it up they will do whatever else is needed which were debridement and clean up stuff. I’m still praying my Rotator Cuff and Glenohumeral something are in good condition and don’t require any intervention. I finally got around to sorting driving lessons, literally after 1 lesson I got the notice for surgery and it all clashes, so I’m not going to have time to fit it all in and get to 100% test standard. Since then 1 lesson were cancelled due to snow, and 2 needed to be cut a little short due to traffic. Better to bank the time than sit in traffic. I’m struggling with two things, one of them is alluding me and its not getting easier, the other is procedure. Bizarrely the things most people struggle with (3 point, parallel and bay parking) I have nearly nailed. 3 point I have never once hit the curb. Even when I had to go all Austin Powers (Spy who shagged me) and do a 10 point point in a narrow road. Seriously, The instructor actually compared the amount of turns to the above clip, and still didn’t hit the curb. Other more simple stuff but potentially more important isn’t coming easy. I need more time on the actual road, a longer gap between lessons to practice. I think the added pressure from the surgery and other stuff has just left me not in the best mindset. I left it too late I fear to actually sort enough lessons or perhaps not enough time to practice due to the lemon car I purchased. The pisser is I’m not sure I will have recovered in time for Body Power 2017, which I think will the first one I will have missed since it started 🙁 This year its in the middle of May (19th-21st) at the NEC in Birmingham. A little bit sucky as I already things in place and moved work around so I can do the show again. Every year I end up getting a different bit of work and missing at least 1 day, this year I’ve planned it all bang on and now surgery is just a few months before the show. On a side note, this post has left me really wanting to watch Austin Powers, I think I need to check if I its on Amazon Movies or order the boxset. Austin Powers video and still capture used for commentary and comedy purposes, I do not own copyright to either of them. I am using them under the fair use clause to parody an event which happened. If you are the rights owner (New Line / Warner Bros) and wish me to remove them, please use the contact form. Some of you who read my health/fitness blog before I moved to blogging here, will know I have quite extensive injuries/damage to both of my shoulders. The consultant doctor who interpreted the last scan (an MRI) used fun words like “Tumorous”, “Cystic”, “Moth Eaten”, “Jagged” and “Arthritic”, lots of fun words like that. The only upside were my rotator cuff has “improved” and is “better”, I couldn’t get him to quantify more than that. Its some times hard to get solid answers, even harder to get the various clinics, consultants, doctors, registrars etc to sing from the same hymn sheet. As a result everything is a little sketchy, and this may not be 100% accurate. 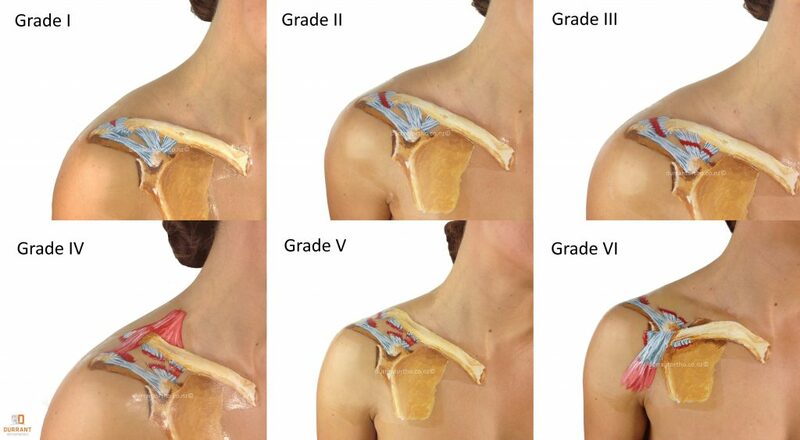 AC Joint Grade Images courtesy of DurrantOrtho. 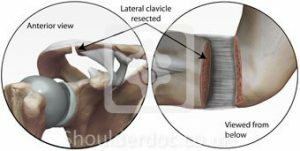 The rather informative Durrant Ortho site has a page on AC Joint Injuries which is awesome and where I borrowed the above image. Mine is somewhere between Grade 2 and Grade 3, its hard to visualise from the descriptions and various explanations but it fits. I’m told once the surgeon physically look inside my shoulder they will tell me exactly what damage were and what were fixed/repaired once I’ve come around from surgery. After a boat load of therapies and various drugs, the last being Triamcinolone injections along with a nerve block (I think), which are injections directly into the shoulder joint and injured areas, which hurts like hell. After that, they finally transferred me from the shoulder specialist to the shoulder trauma clinic. The trauma clinic tell me I have about 4 weeks to make my mind up if I want a rather painful surgery on both shoulders or try more injections. Since its both of my shoulders which are messed up, they would perform surgery unilaterally about 18 months apart. Currently the surgery waiting list for a case like mine, is 2-4 months, which lands the surgery Dec-Feb. The timeline and pain doesn’t sound good at all. When I asked about the pain score, on a scale of 1 to 10, instead they only described it as “horrendous” rather than a score, so I’m guessing that’s about 11 out 10. They went on to explain they going to cut some of my shoulder blade (scapula) off and my collarbone. I didn’t quite catch what about the collarbone. The also very good ShoulderDoc website, which I borrowed the below image from, gives loads of details about the surgery and what happens. It looks BRUTAL! They are also going to clean up my shoulder, which I understand would be removing tumours, cysts, ground bone chips, calcium deposits, general clean up and tidy of the shoulder joint. The “official” word on the various websites inc the Local NHS and Others for recovery and rehabilitation is up to a week in a sling before starting physio, 1-2 weeks before returning to sedentary job, up to 4-6 weeks for a physical work and back to 75% in 3 months. Then up to a 12-18 months for fully healed, slowing improving the whole time. The shoulder trauma consultant (I think she were a registrar, but not sure) used various patients to give me examples of healing times and recovery. She were saying its more likely to be near enough double what the official story says. It could be 6+ months before I could return to the gym, and 18+ months before 100%, at which point I’d need to start building again. Looking at the comments and questions online for example Sports Injury Info makes it look like it could be even worse than that. However the problem is that ACJ Repair, is like saying Car Engine Repair, it could be any of 100 things, all with different healing times. Some have a Rotator Repair (which is a bigger along with Shoulder Girdle), some only the scapula filed, others just a ligament cut, some need extensive stabiliser work, loads of different things. There are also various techniques as well open or keyhole surgery which affect it all too. Its wildly varied, and inconsistent. The only consistent thing, seems to be when you cut parts of the bone away, its intensely painful, and a long slow healing process, lucky me. The things I’m dreading the most are (1) the surgery falling during icy/frozen times and me slipping, (2) person hygiene with my right arm essential out of order for months and (3) being out the gym for months. Images Copyright of DurrantOrtho and ShoulderDoc.